Music is a powerful medium for attracting our attention. Because it is made up of interesting and ever-changing patterns of repetition and contrast, music can be an effective therapeutic tool to promote learning for people with learning disabilities, developmental disabilities, brain injury, etc. Studies show, for example, that people remember information learned using a musical mnemonic. Consider how we all learned our ABCs and to count when young. The music therapist may use familiar or original music that embeds the academic or cognitive information in the song for quick recall. The music therapist may also facilitate music experience that engage the individual while providing the opportunity to practice a specific skill. 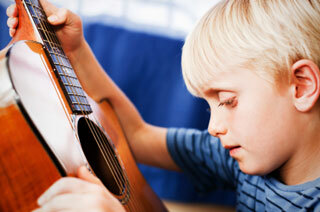 Some studies have shown that studying instrumental music improves academic performance. Music Therapy Services offers adaptive voice and instrument instruction for students with disabilities who may benefit from a more specialized approach.